Ratchet Straps have become a staple in the shipping industry due to their securement purposes and also as well as how durable they are. However, like every product in the world, there are some harmful things that you could be doing to the ratchet straps that you should seriously avoid doing if possible. Not only can these methods destroy your tie down straps, risk potentially safety hazards from overexposure, but could cause damage to your load or other motorists if you are not careful. Let’s begin with some of the most harmful, but most common ways that ratchet straps and tie down straps are damaged every year that could have been potentially avoided. Did you know that direct sunlight exposure to your ratchet straps can cause some serious damage to your tie down straps if left in the sun for too long? 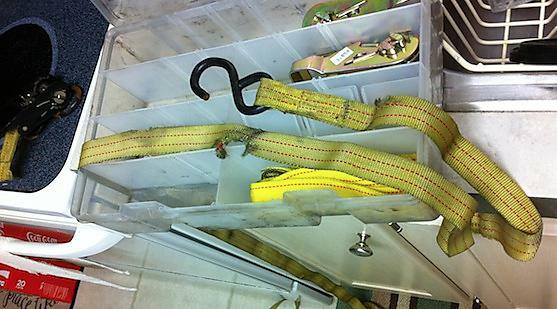 This is why you should always be cautious about where you store your ratchet straps. 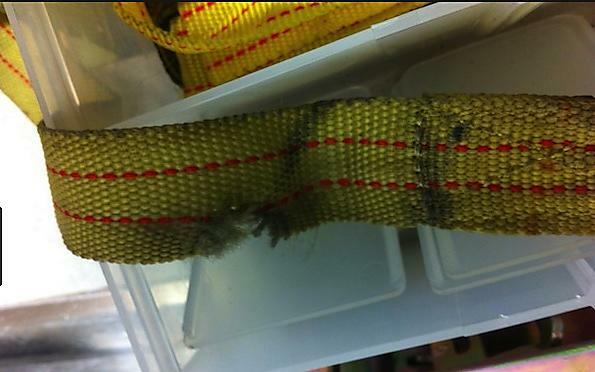 Sunlight damage is the number one way that tie down straps become damaged inside of the shipping industry. This not only can cost you time by needing to replace the tie down straps but also causing you to purchase new tie downs for straps that could have potentially lasted just as long in a near mint condition if they had avoided direct sunlight time. Any reputable tie down expert will always make sure to warn their customers about the danger of the direct sunlight can play an impact on. Remember if you have any questions on how to store your ratchet straps, tie downs, or any other equipment that can be found on our store to call our Cargo Control Experts at 800-483-2189 and we can help keep you and your cargo control products safe from things you may not expect to be potentially dangerous or harmful. Also when you store Ratchet Straps inside of vehicles you should always make sure to place the tie down straps on the passenger side of the vehicle in case you have a tie down come loose during transportation you will not need to fight oncoming traffic in the road. You can help avoid some of the damage that could be potentially done by standing away from the road giving you more space to focus on tying down your load. Small tips like these can help play a part in making a world of a difference in ease and safety. Remember the most important thing when shipping any cargo whether it be locally or across the world is making sure safety is your number one priority. Also, remember to make sure when you are storing ratchet straps on the passenger side of the vehicle that when closing the door no strap piece or ratchet comes outside of the vehicle. This has caused many motorists over the years a ton of damage to their vehicle from having a heavy ratchet swing in the air from moving the vehicle down the road. Lastly, no matter what you prefer to use for your tie-down method it is important to use the tie down storing method that you prefer. Sometimes the perfect fit for you to storing your straps may not always be found on the internet, such as storing neatly wrapped tie-down straps inside of shoe boxes for example. Another one of the most dangerous things that you can do when using Ratchet Straps is having the ratchet straps rub during transportation against a sharp edge or against an object that could rub the webbing. Friction on Ratchet Straps could potentially make some spots of the polyester tie down webbing potentially burn if there was enough friction from wind or simply just going back and forth while transporting such as bumps in the road. 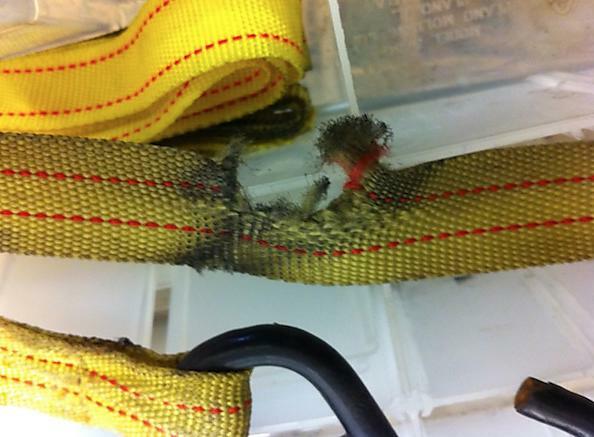 Burning in the polyester webbing of tie down straps can cause serious harm to your cargo if you are not careful. If you see any burn marks that occur during transportation immediately stop using these tie down straps, as they will need to be replaced with another new tie down strap or by another tie down strap that you may have around you that is rated for your Working Load Limit. This could potentially burn all the way through the tie down webbing causing one of the four tie down straps to become undone and jeopardizing your load from coming undone resulting in which could be disastrous. Extreme heat no matter if caused by friction or caused by extreme heat from the sun, direct contact with fire or another heat source such as a heater can cause issues to your tie downs. If you have a tie down strap or ratchet strap if you are unsure of being safe to use or not it is a good rule of thumb to simply just replace the strap. You can also have our experts take a look to see if the tie downs need replacing or not by calling 800-483-2189 and our experts gave give our opinion on if they are safe to use or not. We can also give tips and tricks for avoiding potential burns from occurring in the webbing as well to keep you and your load safe for many uses to come. This one may come at a surprise but anything that could create moisture on your tie down straps could have disastrous results that could occur from doing so. Mold or Mildew can form when storing Ratchet Straps outside or in a wet area, as well as storing ratchet straps in the back of a pickup truck for example. Rainstorms or high humidity can over time form mold on your tie downs. Mold can extremely weaken the strength of your tie down straps as the polyester webbing can become destroyed from mold or mildew. The best way to avoid moisture when it comes to tie down straps is by storing the tie down straps inside of a dry and moisture free area. This prevents the potential of mold or mildew from occurring which can make your ratchet straps remain safe as well as making them last for years to come. What Happens if my Tie Down Straps Become Damaged? The first thing you will want to do if your tie down straps does somehow become damaged is you will want to stop using those straps immediately as those tie downs are no longer safe to use on the road. You never know when your cargo could potentially come off the trailer when transporting and potentially injure other motorists who are sharing the same road. If this does happen to you where you notice your tie down straps or ratchet straps are no longer safe to use there are a few options that you can use. You can either buy new tie down straps or ratchet straps as an option which is not a bad idea. Most Ratchet Straps will last around 3 to 5 years depending on the amount of use to them, as well as the area that they are used in, for example, hot areas or high moisture may last not as long as those who are not. The alternative option would be to look at Replacement Straps. What are replacement straps? Replacement straps simply replace the end of the ratchet strap that has become damaged making a damaged tie down strap practically new if the other side is not damaged. What does this mean for you? You can potentially save money while providing like new condition ratchet straps that are set to be used on the road again. This may require very basic labor however in order to fix the ratchet straps, but our friendly ratchet straps experts would be happy to help you in any way possible to make it easy as possible. If you haven’t had the chance to check out our full guide on how to store ratchet straps make sure to do so! Let’s begin with how to spot damage to Ratchet Straps or Tie Down Straps. Firstly things to look out for is damage to webbing. 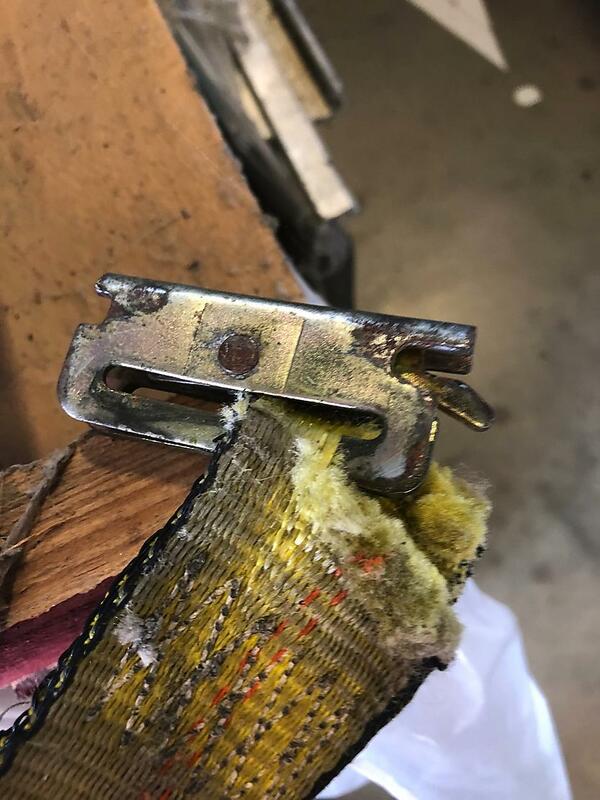 No matter if the damage was caused to you by having burns, mold, sunlight damage, loose polyester or nylon webbing end pieces coming out of the webbing these are all potential issues that are a big deal in the ratchet strap industry to have. The best way to spot the damage and to avoid the damage from occurring to your Ratchet Straps is spotting the damage that is occurring as early as possible. You might be able to help prevent some of the damage that may occur later on such as friction burns, direct sunlight that can be moved out of the sunlight, or in moisture-prone areas that all serve as a threat. Rule of thumb for most ratchet strap damage inspections would be to check the tie downs before you use them to make sure your load is not going to be unsafe during transportation by just eyeing them over before use. When putting the ratchet straps or tie-down straps back you will want to also eye them for any new damage mostly from friction burns for example that may have happened from rubbing against a sharp corner during transportation. Heavy Duty made Ratchet Straps are more prone to taking damage as they tie down webbing that is made from polyester is the more heavy duty, but the damage can happen just as easy. No matter how durable or heavy duty your ratchet straps are you are still prone to damage from occurring. This is why it is incredibly important to make sure that you inspect all size and strengths of ratchet straps, tie downs, and tie down webbing before using them. Another reason that you should always buy from reputable heavy duty tie down suppliers is the quality will often be unmatched from something that you may find somewhere cheaper. Remember that when it comes to the safety of you, your cargo, and other motorists you are sharing the road with that quality is everything. The peace of mind knowing that your tie down straps are not going to shift or cause damage to other motorists is worth the few extra dollars in most cases and can help save you a headache later if some cargo was to break off of a trailer or shift during transportation. Prevent loads from being destroyed during transportation by buying quality heavy duty ratchet straps. One of the most common issues that happen when using Ratchet Straps is having Ratchet Straps that become tangled. Why is having tangled Ratchet Straps bad? Ratchet Straps due to their length when tangled can sometimes become what seems like an endless amount of work to use them again. The good news about tangled ratchet straps You can usually avoid Ratchet Straps from becoming tangled if you take the time to store the ratchet straps correctly. How do you store the Ratchet Straps correctly you may ask? You can store the ratchet straps correctly by taking the time to organize them before storing. Our favorite method of storing Ratchet Straps involve a simple DIY trick such as using Rubber Bands. Simply wind the Tie Downs or Ratchet Straps up so that the webbing is on top of each other such as the image that is displayed above. Once they are rolled up in the proper form you can simply use a household rubber band to keep the straps from coming undone. Although it may take some time the first couple times that you roll the ratchet straps, eventually as it is for everything the more times you roll ratchet straps the easier it will become. Using this simple Do it Yourself Trick you can easily organize Ratchet Straps at the end of using them and have them ready for the next time you need to transport cargo. The time investment of rolling the straps will keep your straps like new after every use as well as preventing any tugging by attempting to untangle the ratchet straps. If your Ratchet Strap does become jammed there are a few quick things that you can do to fix the Jammed Ratchet Strap depending on how badly jammed the strap is. One of the options, as seen in the video below, is to use pliers to remove the webbing and thread the Ratchet strap back to normal and secure once again. YouTube user Powelllife also shows us that there is a nice little trick to help free most of the tangled Ratchet Straps to prevent any damage from occurring from hard tugs. Sometimes Ratchet Straps can be wound wrong making it in a tangled mess that may take some time to get unstuck. One of the best ways, as shown in the video, is to simply reverse the way that the excess polyester webbing went in to the strap. This releases some of the tension to the tie down strap allowing for you to more easily remove the tangled mess before it begins.This trick can save you time, money, and potential headaches from happening when using this nice little trick on how to fix a jammed ratchet strap.